After eight years spent analyzing the human genome and its many regulatory molecules, a team from Northwestern University has discovered a seemingly foolproof self-destruct pathway that can be used to destroy any type of cancer cell. The mechanism involves the creation of small RNA molecules (siRNAs) that interfere with multiple genes essential to the proliferation of fast-growing, malignant cells, but have little effect on normal, healthy cells. Through insights gained in two recent studies, research leader Marcus Peter and his colleagues have characterized the fatal cascade of events these siRNA molecules trigger – dubbed DISE, for Death By Induced Survival gene Elimination – and identified the six-nucleotide-long sequences that are needed for such activity. When examining nucleotide sequences of the many noncoding (meaning they don’t get translated into proteins) RNA molecules our bodies naturally produce to selectively inhibit gene expression, they found that DISE-associated sequences are present at one end of many tumor suppressing RNA strands. Another investigation revealed the sequences are also found embedded in protein-coding sequences throughout the genome. "We think this is how multicellular organisms eliminated cancer before the development of the adaptive immune system, which is about 500 million years old," Peter said in a statement last year. "It could be a fail-safe that forces rogue cells to commit suicide. We believe it is active in every cell protecting us from cancer." But they still needed to determine how the body produces free siRNAs that can trigger DISE. This breakthrough came in another new study, published last month in eLife, wherein Peter and his team observed the process by which our cells chop a larger RNA strand – that codes for a cell death cycle protein called CD95L – into multiple siRNAs. In a series of experiments, they then showed that the same cellular machinery could be used to convert other large protein-coding RNAs into DISE siRNAs. And remarkably, they found that about 3 percent of all the coding RNAs in our genome could be processed to serve this purpose – thanks to the wide distribution of our kill-switch sequence. "Now that we know the kill code, we can trigger the mechanism without having to use chemotherapy and without messing with the genome,” Peter said in a press release last month. He notes that even next-generation medications and emerging gene therapy approaches fail to treat aggressive cancers – such as pancreatic, lung, brain, and ovarian types – because they target the activity of just one gene at a time, yet the diseases are driven by multiple genes. The DISE pathway, on the other hand, kills cancer cells in a brutal, simultaneous attack. "It's like committing suicide by stabbing yourself, shooting yourself and jumping off a building all at the same time. You cannot survive," he explained in 2017. All the research conducted thus far indicates that cancer cells cannot gain resistance to DISE. 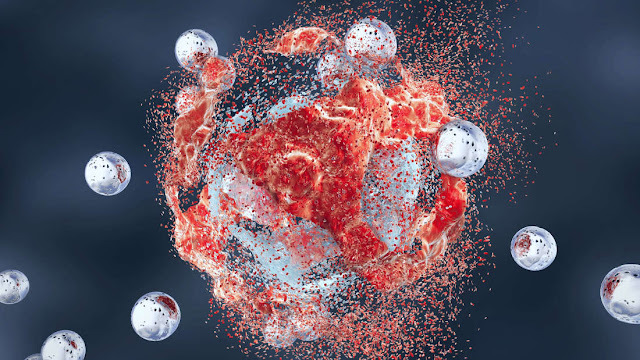 In a proof-of-concept study published in Oncotarget last year (yet another in the recent flurry of papers), the prolific Northwestern team used nanoparticles to deliver DISE siRNAs to the cells of human ovarian tumors that had been implanted in mice. The treatment resulted in a profound reduction in tumor growth without harmful side effects. Work to boost the efficiency of the therapy is already underway. "Based on what we have learned in these [past several] studies, we can now design artificial microRNAs that are much more powerful in killing cancer cells than even the ones developed by nature," Peter concluded.